How can buyers who need to sell before they can buy protect themselves during contract negotiations? Is an offer with a Hubbard Contingency less attractive to home sellers? 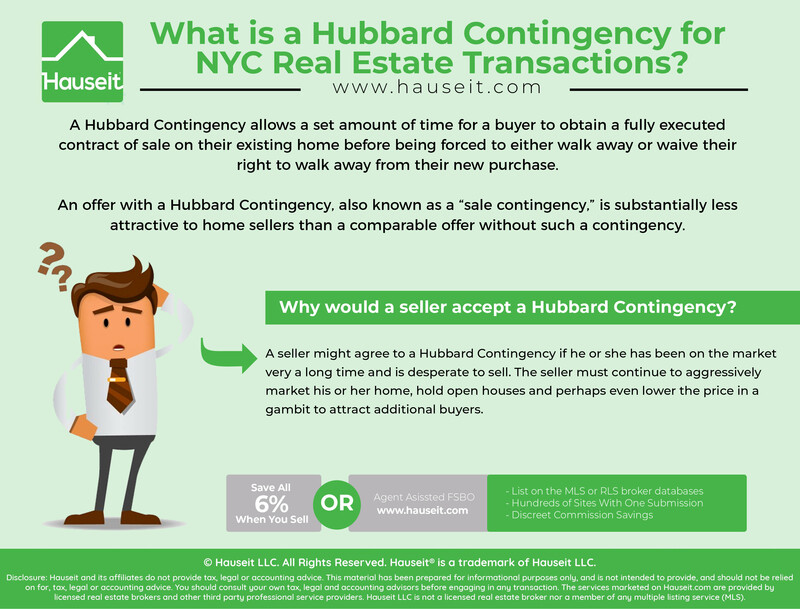 A Hubbard Contingency allows a set amount of time for a buyer to obtain a fully executed contract of sale on their existing home before being forced to either walk away or waive their right to walk away from their new purchase. If negotiated properly with the help of a veteran real estate attorney, a home buyer who needs to sell his old home first won’t have to face the uncertainty of whether he’ll be able to procure the sale proceeds from his old home in time to buy his new property. This is normally a scary prospect for buyers who need the money from selling their old home in order to buy, especially if they are in contract on their new place but haven’t found a buyer yet on their old home. They run the risk of forfeiting their 10% of the contract price “good faith deposit” if they are unable to complete the purchase! An offer with a Hubbard Contingency, also known as a “sale contingency,” is substantially less attractive to home sellers than a comparable offer without such a contingency. This is because the seller has little information on how likely the buyer’s existing apartment will sell, how long it will take and what stage of the process the buyer is in. Even if a property has a Hubbard Contingency but isn’t listed as “in contract,” the seller still might lose interested buyers who learn that there is already an accepted offer, or that the accepted offer level is at a certain price. This might discourage buyers who say they’re not seriously searching and those overly polite buyers who say they don’t want to waste anyone’s time. However, these buyers often times do turn into real offers so it’s best to encourage as many viewings as possible. Keep in mind that in real estate there is no need to disclose such specific information such as offer level and contingencies. Why would a seller accept a Hubbard Contingency? A seller might agree to a Hubbard Contingency if he or she has been on the market very a long time and is desperate to sell. In that case, an offer with a sale contingency might be better than nothing. However, any smart seller will realize that the deal is not binding as the buyer will have a myriad of ways to make sure his existing home doesn’t sell if the buyer wanted to back out. Therefore, the seller must continue to aggressively market his home, hold open houses and perhaps even lower the price in a gambit to attract additional buyers. We’ve included a sample “rider,” or addendum to a purchase contract in New York City. In other parts of the country where purchase agreements are standard forms, the Hubbard Contingency is typically a separate, simple one page form with content similar to the below. This Contract is contingent upon Buyer obtaining a non-contingent contract for the sale of Buyer’s existing home, subject to and in accordance with the further provisions of this Rider. For the purposes of this Rider, a “non-contingent contract” for the sale of Buyer’s existing home shall mean a contract that may not be unilaterally terminated by the purchaser as a result of any condition to be satisfied by the purchaser. Buyer will diligently pursue procurement of a non-contingent contract for the sale of Buyer’s existing home and promptly give Seller written notice if, as, and when such contract is obtained and that the Hubbard Contingency has been satisfied. If Buyer has not been able to obtain said non-contingent contract on or before the Hubbard Contingency Date, Buyer may terminate this Contract by giving written notice to Seller, which notice must be received by Seller not sooner than the Hubbard Contingency Date and later than two business days after the Hubbard Contingency Date, and the notice must unequivocally state that Buyer has not obtained a non-contingent contract on or before the Hubbard Contingency Date and is terminating this Contract as a result. If, prior to satisfaction of the Hubbard Contingency, Seller finds another buyer to purchase a condominium unit that is the subject of the within Contract, Seller may give notice to Buyer so stating. If Buyer desires keep the within Contract for Buyer’s purchase in effect, Buyer may do so by giving written notice to Seller that unequivocally states that Buyer is waiving the Hubbard Contingency, which notice must be received by Seller within forty-eight (48) hours of receipt by Buyer of Seller’s notice. If Seller gives Buyer notice under this paragraph and Buyer does not waive the Hubbard Contingency in the manner provided herein, Seller have the option, in Seller’s sole and absolute discretion, to terminate this Contract, in which event, Seller shall be free to sell the premises to another party. If the Contract is duly terminated in compliance with the provisions of this Rider, Seller shall promptly return Buyer’s deposit, without interest. If the Contract is not so terminated, the Hubbard Contingency shall be deemed satisfied and no longer a condition of the contract. IN WITNESS WHEREOF, the parties hereto have executed this Rider.